Tickets are on sale now to see To Kill a Mockingbird at the Shubert Theatre on Broadway. Academy Award winner Aaron Sorkin's new stage adaptation of Harper Lee's classic novel To Kill a Mockingbird, directed by Tony winner Bartlett Sher, is scheduled to officially open on Broadway on December 13, 2018, following previews from November 1. Harper Lee's debut novel was published in 1960 and won the Pulitzer Prize for Fiction. It has gone on to sell over 50 million copies in print to date and has been published in over 40 different languages. Set in Alabama in the 1930s, Harper Lee’s enduring story of racial injustice and childhood innocence centers on one of the most beloved and admired characters in American literature, the small-town lawyer Atticus Finch, to be played by Jeff Daniels. The cast of characters includes Atticus’s daughter Scout (Celia Keenan-Bolger), her brother Jem (Will Pullen), their visiting friend Dill (Gideon Glick), and their mysterious neighbor, the reclusive Arthur “Boo” Radley (Danny Wolohan). The other indelible residents of Maycomb, Alabama will be brought to life on stage by Frederick Weller (as Bob Ewell), Gbenga Akinnagbe (playing Tom Robinson), Stark Sands (as prosecutor Horace Gilmer), Dakin Matthews (playing Judge Taylor), Erin Wilhelmi (as Mayella Ewell), and LaTanya Richardson Jackson (as Calpurnia). Performance schedules for all shows are subject to change. 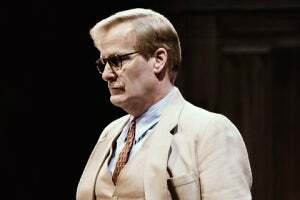 Official production photos have now been released for the Broadway production of the Harper Lee classic, To Kill a Mockingbird, newly adapted for the stage by Academy Award winner Aaron Sorkin, which began previews at at the Shubert Theatre on November 1, 2018. An official opening night is scheduled for December 13. Previews begin at at the Shubert Theatre tonight for the long-in-the-works Broadway production of the Harper Lee classic, To Kill a Mockingbird, newly adapted for the stage by Academy Award winner Aaron Sorkin. Directed by Tony Award winner Bartlett Sher, an official opening night is scheduled for December 13, 2018.